Organizing ribbon for scrapbooks can be a daunting task for some. If you're like me, I'm a self-proclaimed ribbon-o-holic, I tend to take the same approach to buying ribbon as I do when buying paper - "Buy it and the layout will come." So, what does that leave me with?... Lots of ribbon waiting for a home on my layouts. Before I let you in on how I go about organizing ribbon for scrapbooks, I wanted to give you some other options to ponder as these may very well work for you. Some people like to use one or more ribbon boxes. Ribbon boxes look like modified shoe boxes with holes punched in the side. Inside the ribbon box you will find dowels onto which you slide your spools of ribbon, then you thread the ribbon through the appropriate hole. The end result is a shoe box with a bunch of "spider legs." To me, the benefit of ribbon boxes is that they can hold a lot of ribbon and you don't have to spend a lot of time organizing it (you'll see what I mean by that in a minute). I don't see any real disadvantage with ribbon boxes, unless (like me) you have cats that like to eat ribbon. Some people don't bother with the box portion of a ribbon box and choose to just use the dowels. It's a similar set-up to what you would hang a roll of paper towels on, but it's smaller. To me, this option would only benefit someone who doesn't have a lot of ribbon and who has the wall space to mount something like this. 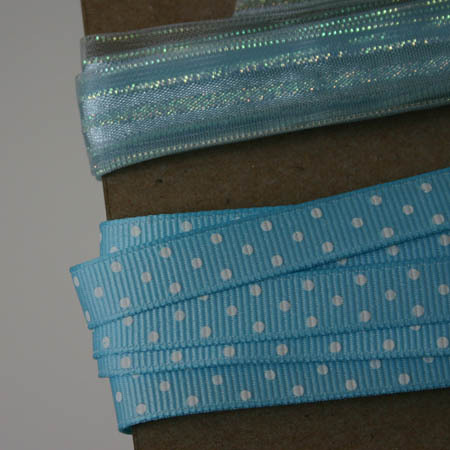 Ribbon cards are made of sturdy cardboard and allow you to store ribbon of like colors or patterns on the same card. But...they're a little more labor intensive in that you have to wrap your ribbon around them first before you can store them. To me, I don't have the time, nor would I want to spend the time, taking my ribbon off the spool, just to wrap it around something else. Don't get me wrong, it's a great way to keep your ribbon in a color-coordinated order, but it's just not my thing. I'd rather spend my time scrapping instead of organizing. To store your ribbon cards, you can either use a pre-fabricated embellishment drawer like this one from Cropper Hopper, or you can use a photo storage box. If you like this idea, but are looking to cut down on costs, you can use chipboard for your ribbon cards instead of buying a "brand name" version. 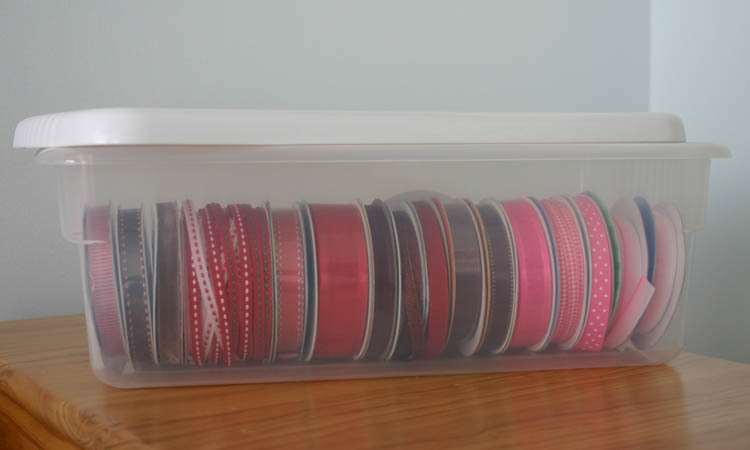 Ribbon storage drawers are similar to ribbon boxes, but don't have the dowels and can't hold as many spools of ribbon. Cropper Hopper makes ribbon storage drawers in three different sizes - small, medium and large - depending on the size of your spool. These, like the ribbon spool or card method, are great if you don't have too many spools of ribbon to deal with. They're also more compact that the ribbon boxes, which is helpful if you are scrapping in a small space. So, you're probably wondering, well...how do YOU organize your ribbon? Well, I use a modified version of the "ribbon box" method. I like to call it the "Rubbermaid" method. I really like to be able to store a lot of my ribbon in one place, which a ribbon box would allow me to do, but...I have cats, so a box with a bunch of ribbon hanging out of it is an invitation for disaster. What I do is store my ribbon spools in Rubbermaid (or the closest generic equivalent) rectangular containers - I find about 6 qt. size works the best. I also color coordinate my ribbon, so all my reds/pinks in one box, yellow/oranges in one box, etc. and since the boxes are see-through, I don't have to take the time digging into the box just to find a color. I hope these few tidbits have given you a few ideas on organizing ribbon for scrapbooks and I'd love to know if you use these or any other methods for organizing your ribbon (see form below). If you have any questions, please don't hesitate to send me an e-mail. How Do You Organize Ribbon?